If you are arranging a trip to Northern Italy, such as to Milan or Lake Como, you must plan to spend a day visiting the beautiful island of Isola Bella. Located on Lake Maggiore, Italy's second largest lake, Isola Bella is a magical place of natural and man-made beauty and wonder. You can explore the incredible Palazzo Borromeo and its fantastical terraced gardens, relax for a delicious lunch at one of the island's restaurants, and enjoy a peaceful ferry ride from and then back to your original point of origin on the edge of the lake. This page will introduce you to the history of and sites to be seen on Isola Bella, as well as share travel tips for planning your excursion. All photos on this page are by the author, sockii. Check out my full photo album, Arona to Isola Bella, on Flickr. Isola Bella is one of the Borromean Islands of Lake Maggiore in northern Italy. Lake Maggiore is the second largest lake in all of Italy, with its northernmost point crossing over into Switzerland. The island of Isola Bella is located in the Borromean Gulf nearest to the town of Stresa. The island is a mere 320 meters long by 400 meters wide, and predominantly occupied by the Palazzo Borromeo and its terrace garden. Until the early 17th century the island was little more than a small fishing village, but in 1632 the powerful Carlo III of the House of Borromeo began building a palazzo there named for his wife, Isabella D'Adda. Mid-century the construction plans were sidetracked by a terrible outbreak of the plague. Ownership of the island then transferred to Carlo's sons, who worked with architect Carlo Fontana to create not just a simple villa but a palace worthy of entertaining the greatest nobility of Europe. The gardens were not completed until 1671. During the period of Giberto V Borromeo (1751–1837), Isola Bella would achieve its highest societal importance hosting such guests as Napoleon and his wife Josephine, and Caroline of Brunswick, the Princess of Wales. Today, the island is maintained as a popular tourist destination, where one can explore the magnificent palazzo and its gardens, as well as shop in small boutiques and dine on tempting Italian and European cuisine. Isola Bella is easy to reach if you are visiting other destinations in Lombardy or also Switzerland. Regular trains operated by Trenitalia connect Milan to Arona and Stresa, both located directly on Lake Maggiore. From either Arona or Stresa you can pick up the Lake Maggiore Ferry Service and travel to Isola Bella. Ferries return back from Isola Bella until early evening (6:30pm on the summer schedule) and you can buy different tickets based on whether you just wish to visit Isola Bella or the other islands of the lake, including Isola Superiore and Isola Madre. The train from Milan takes only about an hour and runs frequently. The ferry service is quickest from nearby Stressa (only about 10 minutes), however the hour-long ride from Arona is quite relaxing and a wonderful chance to see some of the scenery along Lake Maggiore's shoreline. 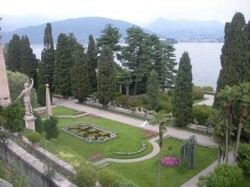 Once you arrive at Isola Bella, go to the ticket office where you can purchase admissions to the Garden and the Palazzo. Last admission times are between 5-5:30 pm and plan on at least 90 minutes to 2 hours to explore them all. 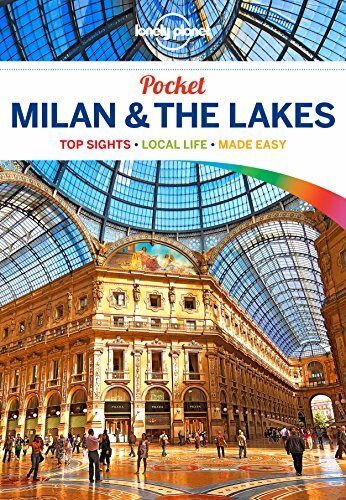 In the Palazzo you can see such wonderful sites as the Ballroom, Napoleon's Room, numerous Grottoes, the Tapestry Gallery, the Queen's Room, and much more. Paths will guide you through the palace and then you will emerge in the gardens where you can explore multiple levels of greenery, flowers, sculpture, a tropical greenhouse and aviary. Leaving Arona for Isola Bella. Stopping at an ancient monastery along the shoreline. The approach to Isola Bella after a stop at Stresa. Isola Bella framed by the magnificent peaks of the distant Alps. There are several restaurants and cafes on Isola Bella, where you can take a rest and enjoy food and drink in a lovely setting. I would recommend Ristorante Delfino above all other options should you wish to enjoy a truly outstanding, authentic Northern Italian meal with wonderful views of Lake Maggiore. Often in Italy, restaurants with the best views and locations do not serve the best food. This is not the case at Ristorante Delfino, which serves outstanding meals which showcase the cooking traditions and ingredients of the Italian lake region. Here you can enjoy lake trout prepared in numerous ways: chilled in sauce as an antipasti; grilled and mixed with pasta; pan-fried with delicate oil and herb sauces. Other traditional Italian favorites can be found here including pizza, excellent focaccia, and linguine with white clam sauce. You will notice that butter is more prevalent in the cooking in this region than olive oil, and garlic is not as favored as in more southern and central Italian cooking. Do not miss the chance to enjoy this wonderful restaurant should you come to Isola Bella. Lake Fish Four Ways - a delightful antipasti. Focaccia with Speck and Fennel Seed. Spaghetti with Grilled Lake Trout. Pan-Sauteed Lake Fish. Pan-Sauteed Lake Fish. Official website of the Borromeo Islands. Learn more about Isola Bella and the other islands of Lake Maggiore. TripAdvisor's page on Isola Bella, where you can read other travelers' reviews, hints, tips and information. A guide to Stresa, the lakeshore town closest to Isola Bella on Lake Maggiore. 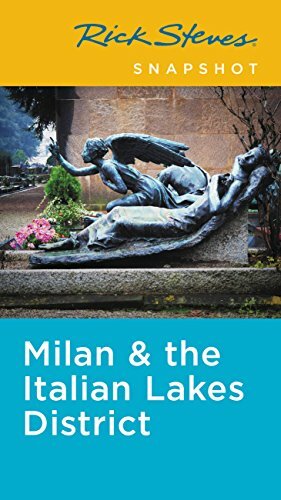 Learn more about this charming place, which you may also wish to visit while exploring Italy's lake region. Official site dedicated to transit options around Italy's northern lakes. 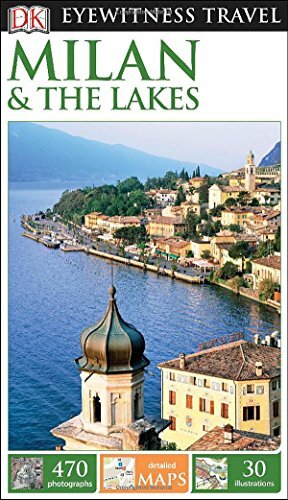 Learn more about Lake Maggiore, and why you should consider spending some time here while exploring and traveling through Italy. Lots of news and travel related information here on the official website of the district. I hope you've enjoyed this brief introduction to Isola Bella, and perhaps may wish to visit someday yourself. Please feel free to leave me your comments and thoughts, they are always greatly appreciated!